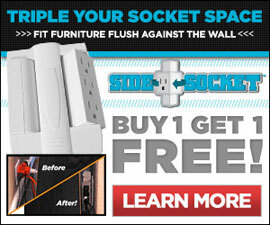 The Side Socket turns a typical two-socket outlet into a six-socket outlet. The incredibly genius part about the Side Socket is the swiveling sockets which saves space, organizes, and prevents damages. The Side Socket is much like an extension cord without the cord. It has also been called a Side Socket Surge Protector because it protects against electrical surges. The Side Socket fits over both of the sockets in an outlet. There are three sockets on either side of the Side Socket that rotate 90 degrees from the front to the side. All six of the sockets on the Side Socket are capable of housing cords with three-prongs, which make it even more convenient.